Cedar Rapids, Iowa – Reading, writing, arithmetic and energy efficiency? The new Prairie Elementary School in the College Community School District (CSD) is using energy-efficiency technology to enrich students’ learning experience. College CSD recently completed several energy-efficiency projects of the new Prairie Elementary School. Projects included the installation of a geothermal heating and cooling system, alternative heating, ventilation and air conditioning system lighting controls and energy-efficient windows. With these upgrades, the school district expects to reduce energy usage and increase cost savings. 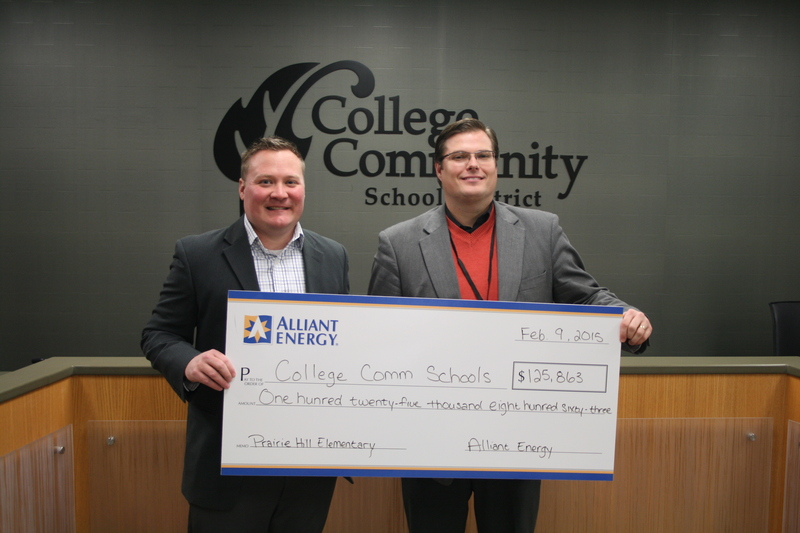 Chris Tompkins, Alliant Energy key account manager presents John Speer, College Community School District superintendent, with a rebate check for the school district’s recent energy efficiency projects. The projects were part of our company’s Commercial New Construction program. College CSD expects to save a staggering 711,000 kilowatt-hours per year, totaling more than $100,000 per year in energy savings. The energy savings are equivalent to removing approximately 103 passenger vehicles from Iowa roadways or the amount of carbon dioxide sequestered by nearly 402 acres of forest in the United States. In addition to the anticipated energy and cost savings, the College CSD received a rebate of $125,863. The Commercial New Construction program is available for businesses and organizations that want to reduce energy usage and save money on new buildings. Our company also offers a number of other rebates on lighting, computer equipment, motors and more. These programs are available to Alliant Energy retail electric and gas customers located in its Iowa service area. For more information, visit alliantenergy.com/cnc or call 1-866-ALLIANT (866-255-4268).